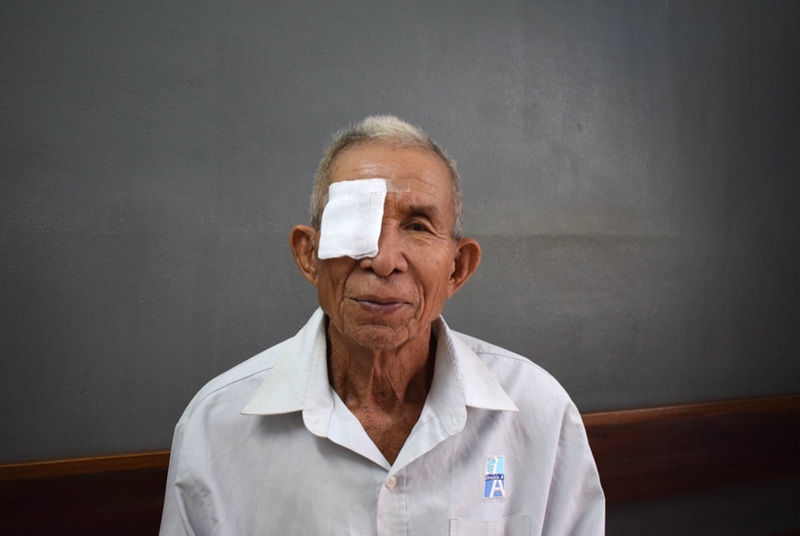 With his family, Mr Kikeo lives in another province, called Salavan (40 miles away) and he travelled all the way to Pakse especially to be examined by the medics of Asian Eye Care. His family possesses a piece of land in Salavan, where they grow rice, among other things. Because Mr Kikeo is already very old, he does not work anymore and his family looks after him. Since a couple of years, his eyes had been seeing less and less and it became increasingly unpleasant for him to go outside, as bright sunlight is troublesome to him. This is typical of cataract. His daughter is a nurse in the district hospital in Salavan and heard through the grapevine about the AEC project. Yesterday, Mr Kikeo had the cataract in his eye treated. What he looks forward to most is going outside again without any problem and accompanying his family again when they work on the farm!